Cashing up in less than a minute is what you get with the innovative RS money scales. Thanks to their scale function they reliably count pre-sorted banknotes, coins and money rolls (RS 1200/2000). You comfortably read the individual amounts, as well as the total sum, from the well laid out display. For complete cashing up the scales constantly check to make sure that the coins and banknotes to be counted are in the right order. They automatically add all the tallies to generate an overall result. 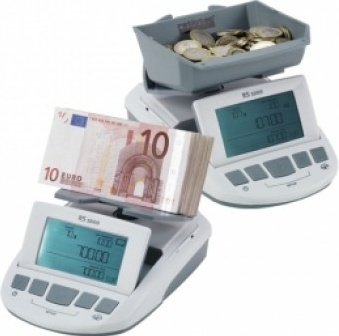 The RS money scales are designed standard for EUR, GBP and CHF; additionally they feature integrated weight functions for non-cash documents (such as coupons, tokens, letters, etc.). Thanks to the additional change function (RS 1200/2000) you may set up any desired float amount to be directly deducted from, so that only the daily intake is shown. Thanks to battery operation the scales are mobile, making them ideal as helping hands during normal business hours. The RS 2000 has an intelligent and self-learning weighing algorithm, and thus does not require an update for new banknotes. Also customizable for vouchers, tokens, coupons, etc.